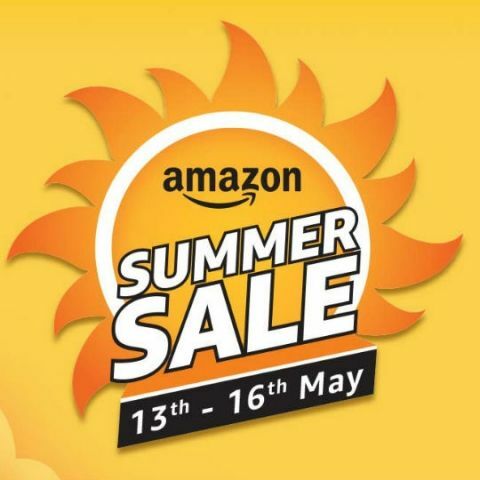 During the Summer Sale, Amazon will offer up to 40% off on mobile phones and accessories, 50% off on electronics, and more. It seems like it’s going to start raining deals soon. Just like Flipkart, Amazon has announced that it too will hold a special sale on its website. Called the Summer Sale, it will be held from May 13 to May 16. During the sale, a whole host of products will be available at a discount, ranging from home and kitchen appliances, to daily essentials. However, here at Digit, we’re all about tech, so here are some tech deals you should keep a lookout for. During the sale, Amazon will offer upto 40% off on mobile phones and accessories. This would include the 64GB variant of the Honor 7X smartphone, which will be priced at Rs 12,999, down from its launch price of Rs 15,999. Further, buyers can also avail No Cost EMI, and an additional Rs 2,000 discount on exchange. Amazon will also offer discounts on phone accessories like Bluetooth headsets, mobile cases and power banks. Amazon will offer up to 50% off on electronics such as headphones, storage and PC accessories. Buyers can avail up to Rs 20,000 off on laptops, and 55% off on cameras and accessories. Speakers will get a 60% discount. Buyers can avail up to 35% discount on TVs and appliances. This would include the TCL 39-inch Full HD TV, which will be available at Rs 16,999 during the sale. 4K TVs and Smart TVs will get up to 40% off. As mentioned earlier, Flipkart is also holding its Big Shopping Days sale on the same days. The company is teasing considerable price drop for the Google Pixel 2 smartphones as well as the Samsung Galaxy On Nxt. The Pixel 2 is tipped to be available at a starting price of Rs 34,999, while the Galaxy On Nxt will be available at Rs 10,900.